Lock into low prices for life. Save 33% on advertising subscription! Over 60000 people visit the SCUBA Travel site each month looking for information on diving. Wouldn't you like them to know about your dive company? You can lock into our low prices for the life of your advert - no price increases ever! Highlight your company near the top of the page dedicated to your location. 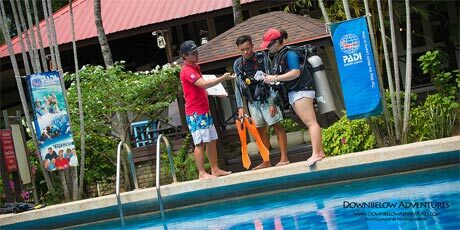 Visitors to this page are specifically researching dive operators in your area, so you will reach an extremely targeted audience. For example, if you were a dive operator in Bali you would be promoted on the Diving Bali page. Promote your listing on our Twitter, Facebook and Google+ pages (with over 25000 followers), in SCUBA News (over 7000 subscribers) and in our rss feed (displayed on over 40 other diving web sites). Include your logo and photos. Connect to your web and social media sites. "We have recently started using Google Analytics to track website traffic and we have found that we have quite a few leads directly from this (the SCUBA Travel) site. " The basic charge for a promoted listing is £12 a month with a minimum term of 4 months. For recurring payments by Paypal though, we are happy to offer a 33% discount, bringing the cost down to just £8 per month. And you can cancel the Paypal payments at any time - there is no minimum term. "The site looks great, and we have had some feedback already." Kym Miller, Compass Charters, on their listing on the SCUBA Travel site. New: for just £99 a year you can obtain both a promoted listing and an entire web page dedicated to your company, hosted on the SCUBA Travel site, with photos and videos. This typically generates a 30% click-through rate.